I was perusing my posts yesterday and realized I had not shared this amazing post with you! It is perfect for organizing kids and their sea of paper that comes home from school! I am currently dabbling in the thought of going paperless ... but until then I am still using this system I put into place in August! 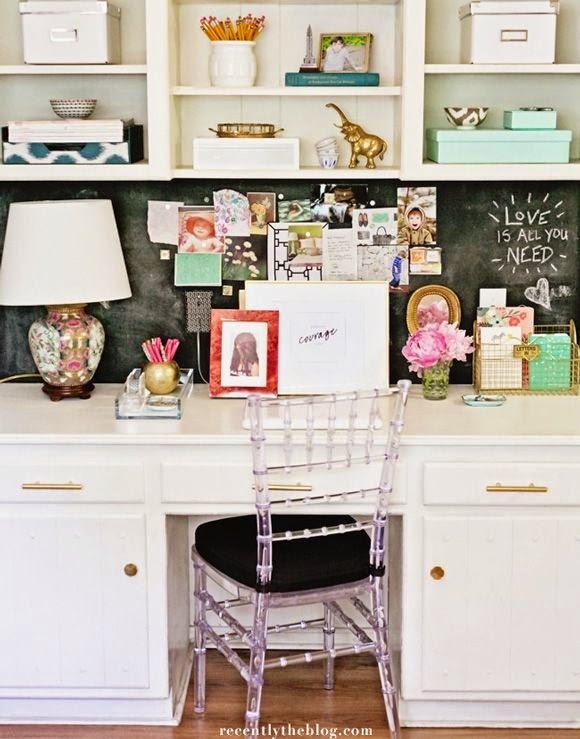 This post was a guest post on 11 Magnolia Lane on Organization ... hope you enjoy!! With another school year encroaching upon me I knew I needed to put on my organization hat and get myself ready for another year. This year I have a senior (we call it the s word around here), a seventh grader, and a fourth grader ... all in different schools and adding in one new school to the mix. Three schools, with three administrations and three sets of papers galore. Lord help me! I needed to revamp my system of paper storage ... like STAT!! And I love it!! It looks good and its amazingly functional for the drop zone just inside the garage door where all the papers seem to land! And yes, that is a chalkboard back splash ... just waiting for someone to write all over it!! A candle for my serenity and plenty of pens for signing papers and marking my calender. I use a different color sharpie pen for each child and for myself. It's easier for me to know where to be and for whom to attend. And my favorite Palm Beach map from Palm Beach Lately! Binder clips, push pins, plenty of space for mail for me to file and cute tape to close notes to teachers! The ghost chair is perfect for this space. It doesn't feel bulky and I just love how surprisingly comfortable they are. Thank you Whole Paycheck for your amazing 50 mm roses. They are worth every cent of the 14.99 I pay for them to be HUGE and last three weeks! Vintage brass mailbox for the mail the kids bring in from the bus. I can not stand any paper on the desk so they are told to place it here. They think I am weird and I let them. We also have a policy for papers that need to be signed. They leave them for me on the desk. I spot them in 2.2 seconds and sign and return them STAT. I do not like any random papers lying about. It makes me crazy. And ps. I may be super type A. But you probably already knew that! The rest of the papers we need to keep are filed directly to the left of this cute little revamped desk area in a hanging filing system. One cubby for each child and each subject. They place there crud on my desk. I decide if we need to keep/trash and then I file it accordingly. All paper is contained at all times! Behind the desk is the rest of the school organization area. These two baskets house anything random they have from school. Little Bit's basket currently contains a happy for a friend, a deck of cards, extra headphones (in case she loses her first pair) and her thankful journal. Her brother's has his thankful journal, a rock (or six), one or two random pens and I am sure something I can't identify. Above the baskets is the bulletin board for party invites and school flyers they want to keep ... you know the talent show and the like. It is still filled with fun summer notes, cards and pics at the moment! And underneath is every single thing we use for school. If we own it, it lives here! And its labeled to cut down on the ... do you know where the fill in the blank is?? I love this system. People ask me all the time if I home school when they see it! Bless them ... that would be a NO! That isn't my calling. This just works for us when it comes to housing 19,000 colored pencils and every other school related supply. It doesn't matter if your babies are 7 or 17, they still use colored pencils and glue sticks! Fast forward six months and I am still loving this redo! It works perfectly to corral papers and school stuff that would have normally been spread all over my table and counter! Now if I can just curb my sea of mess that seems to be covering those two spots ... hee hee!! I love this space, it's so organized! It makes me happy! Everything is so organized! I love it!!! I need to get with it! My desk area is a mess then I clean it, then it's a mess again like 2 days later! Vicious cycle! I LOVE that brass mailbox!! I loved revisiting this space!! Love the chalkboard backsplash.